The Esalen Office Crew escaped the office for the wilds of Big Sur. 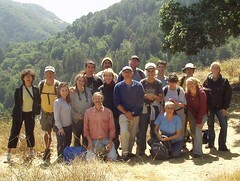 We visitied Big Creek for a Natural and Cultural History of Big Sur 101 course. From the history of the native peoples to the early settlers, from geology to ecology we covered a little about a lot of things. What a blessing to live in such beauty. Many thanks to the Esalen office crew for the daily work they do.